The readers who will compare everything the writer creates to the said phenomenal book and it becomes even harder to satisfy the reader even if the next books are good. 🌟 What I am trying to explain here is that this book is good but it is not A Man Called Ove. If I want to describe this I would say it is A Man Called Ove meets Eleanor Oliphant is Completely Fine. This is not a fair comparison because this was released years before Eleanor Oliphant. Anyway, Fredrik is the best author in writing elderly characters and making them grow on readers with every page, we end up liking them at the end because there are no alternatives! 🌟 Britt-Marie was a peculiar character that will stick with me for a long time with her (Ha)s and Sodium carbs and Faxine. Fredrik also tried to develop other characters in the story which was -another time- good but comparing it to Beartown I know he improved immensely. 🌟 The writing was good, It gave me goosebumps once but this is the first time I survive a Backman book without crying. 🌟 So it had good writing, memorable characters with nice development. The story is character driven as usual. It kind of feels like a debut but since I read his other works I can say that I appreciate this book as it made the author progress more and write another masterpieces as Bear Town and Us Against you! I ended up giving it 3.5 out of 5 stars! 🌟 Prescription: For fans of Eleanor Oliphant is completely Fine and other memorable characters. 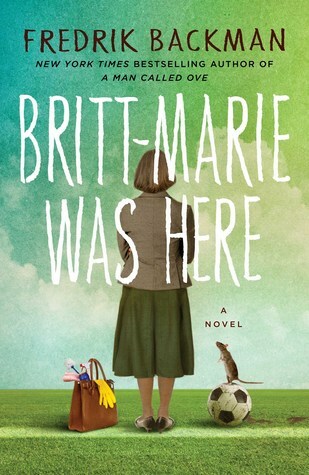 Excellent review I love how you explain Fredrik Backman’s evolution! I have read Beartown a Us Ahainst You so far and loved it ! I’ve been meaning to read this one since I finished A Man Called Ove. Fredrick Backman is incredible. Amazing review as always Hamad! Yup. I totally agree with this. I read this soon after Ove and I couldn’t finish it. I think, I made it about half way. Sometimes, I think I’ll go back. Although, so many people who have read it said it was just okay. I don’t know that I ever will go back. It so felt like a debut novel!